It's a well known fact that Dreamworks Animation likes sequels. They have produced four films in the Shrek series, along with an upcoming spinoff for the Puss in Boots character, two Madagascar films with two more planned and have stated that six films are to cover a long story arc in the Kung Fu Panda series. Whether this is milking or not remains to be seen, but it's clear that Kung Fu Panda 2, the sequel to the 2008 summer hit, is far from a cash in. 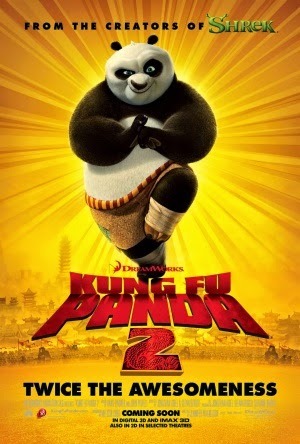 The plot revolves around Po (Jack Black), who after the events from the first movie has become the Dragon Warrior, fighting crime across China alongside the Furious Five. But after a disturbing vision of his past, he attempts to gain inner peace and solve his identity crisis, which leads him to take on Lord Shen (Gary Oldman), a peacock banished from his clan, who is manipulating the graceful powers of fireworks to create a weapon that could potentially extinguish kung fu itself, forcing Po and his friends to destroy it and Lord Shen before it's too late. As always, Dreamworks have crafted a truly beautiful film, with wonderful environments, clear attention to detail and fluid character animation. The animation certainly has a darker vibe than the previous film (which matches that of the story and characters) and that works to great effect in establishing a more serious tone. I did see the film in 3D, and despite the incredibly idiotic and annoying reactions from other people in the cinema (OH WOW IT'S LIKE THREE DEE YEAH HOW INCREDIBLE OMG), it was actually nicely implemented. The film's animation style doesn't seem to lean toward colourful and cute, so not a lot of saturation was lost with the glasses, and the action scenes definitely benefited from the 3D effect. If you truly despise 3D, however, this isn't going to alter your perceptions of it. And as with the first movie, the soundtrack (composed by Hans Zimmer, god of all music, as well as John Powell) perfectly captures the essence of China and kung fu and really helps drive the action scenes as well as the deep moments. I was really impressed by the somewhat dark tone the film takes with it's storytelling, exploring Po's past in a dramatic and saddening manner (I confess: I nearly cried at one point) which gives further justification for this sequel and also allows us to relate to Po more. Don't worry though; it's not a depressing ordeal, and there's loads of laughs throughout. Some felt a bit out of place, but it's all genuinely funny. The villain, Lord Shen, is easily one of my favourite animated villains of all time. Thanks to strong development and a fantastic voice over by Gary Oldman, he not only comes off as sadistic and threatening, but has a surprising element of depth to his character and is not just a generic, spiteful git. Tai Lung was a brilliant villain, but Lord Shen is, in my eyes, easily superior. The Furious Five still play a large role in the film as they assist Po, and although they lack the same amount of depth, it actually works in conjunction with everything else as, to be honest, they don't really need to be explored. They're established as faithful friends and provide a lot of the comic relief throughout. The solid voice cast from the original film returns to bring life to these great characters, and do just that brilliantly. Jack Black gives Po his lovable comedic charm and still manages to let us take the character seriously during some of the dramatic moments. The same can be said for the Furius Five voice overs (Angelina Jolie, Jackie Chan, Seth Rogen, Lucy Liu and David Cross) as well as Dustin Hoffman as Master Shifu. Gary Oldman, as I previously said, provides a truly sinister and sadistic voice over for Lord Shen, and proves to be, in my opinion, the best actor in the film. By far. Easily one of Dreamworks' finest productions, Kung Fu Panda 2 succeeds in crafting a story comprised of wonderful dramatic depth and plenty of comedy. The characters are lovable, the voice acting is spot on, the animation is utterly beautiful (not to mention the 3D effect is actually pretty good) and the somewhat dark tone the story leans toward makes for a more exciting experience that the original movie offered, yet it can still appeal to children of all ages. If you're a fan of the original, Dreamworks or just animated movies in general, this comes highly recommended.